This post continues the retelling of my 2017 trip to Belize: participating in an archaeology field school and learning about jaguar conservation. The rest of this series can be found in the ‘Travel‘ category of this blog. This post picks up where the previous entry for June 19, 2017 left off: at the entrance to the Belize Zoo. I had come to “the best little zoo in the world” to meet with their Education Director, Jamal. Everyone I had spoken to about my interest in jaguars said that I had to visit the Belize Zoo, and I was hoping that Jamal could tell me more about the zoo’s work regarding jaguars – and help me identify fruitful avenues for my master’s thesis. 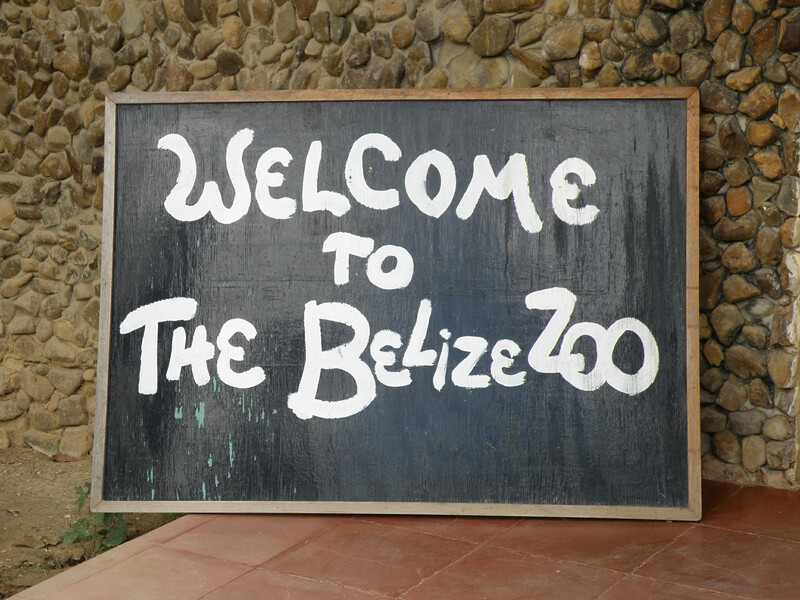 An important sign that was hung near the Belize Zoo’s ticket window. When I walked up to the zoo’s ticket window, it was staffed by a man named Edson. I told him why I was there, and then hit him with a series of questions. He patiently answered all my inquiries, and let Jamal know that I had arrived. Jamal came out after a short wait, and explained that the zoo was short-staffed today. He asked if we could reschedule for tomorrow morning, to which I agreed. This gave me plenty of time to explore the zoo. The weather that day was intermittently cloudy, with an occasional light rain. I began touring the zoo exhibits, which were organized along several paved paths: all lined with native vegetation. After being so purpose-driven for the past three weeks, it felt good to be able to wander aimlessly. I saw a host of Belizean animals, many of whom I had never encountered before. There were tapirs, jaguarundis, American and Morelet’s crocodiles, margays, ocelots, grey foxes, pumas, spider monkeys, massive harpy eagles, and more. Of course, the Belize Zoo is mostly known for its jaguars. An American crocodile (Crocodylus acutus) at the Belize Zoo. A sleeping puma (Puma concolor) at the Belize Zoo. Unfortunately, I wasn’t able to get a shot of its face. A scarlet macaw (Ara macao) at the Belize Zoo. A grey fox (Urocyon cinereoargenteus) at the Belize Zoo. A harpy eagle (Harpia harpyja), one of the largest eagles in the world, at the Belize Zoo. I eventually ambled into what I call the ‘jaguar wing’ of the zoo. This area contained several jaguar enclosures, along with a host of educational signs about the cats. 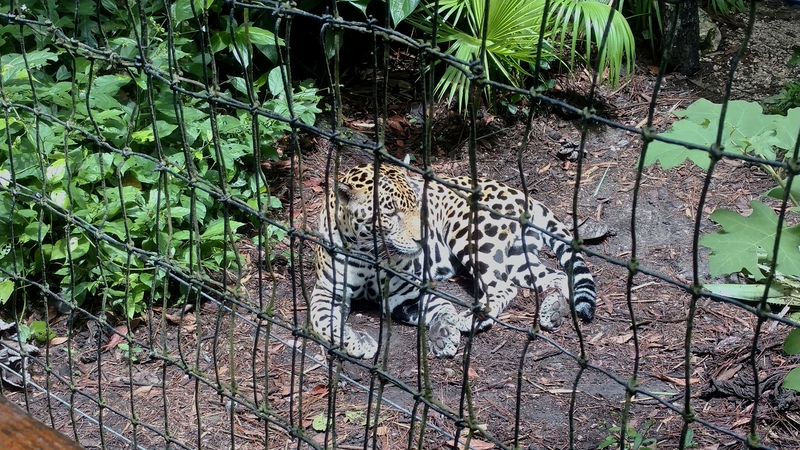 But as I walked past the various cages, I could not find any jaguars. At one point I rounded a corner, and there – less than 3 meters (9 ft) in front of me – was a jaguar. This individual’s name was Junior Buddy, and I was surprised by how big he was. I mean, I had known that jaguars were the third largest cat in the world. However, I expected them to appear short and stocky. Junior Buddy was considerably taller than I had anticipated. Most impressive of all was his muscular frame, which exuded power. Junior Buddy relaxing at the Belize Zoo. I had a few minutes alone with Junior Buddy, before a family of American tourists showed up. One of the daughters appeared to be in her 20s, and she asked me several questions about jaguars. She apparently mistook me for a zoo employee, which took me aback slightly. Could she not realize that I was another traveler? Perhaps not. Although we were both Americans visiting Belize, we were there for entirely different reasons. I had also been living in the country for nearly a month by then, and probably appeared less ‘touristy’ than I had initially. The young woman was friendly and polite, but our brief conversation revealed that we were worlds apart. Once I had finished at the zoo, a man named Antonio took me to my accommodations at the Tropical Education Center/Zoo Lodge (TEC). I had reserved a room in their Pond House, which proved quite comfortable. It had a hot shower, my first in Belize, which I hardly used. I had grown so used to cold showers by then that the hot water felt uncomfortable on my skin. I turned in for the night after a pleasant hike on one of the TEC’s many trails. Before I fell asleep, I received a message from from Mike the seminarian. It turned out that the place he was staying at was too far outside San Ignacio for my purposes. But all was not lost, as he sent me links to two highly-regarded hostels in the city. Tomorrow I would finally get to talk jaguars. Another excellent post Josh or should l call you the non touristy ‘swarthy’ looking chap? Haha, thanks Bloke! I probably just looked really tired and dirty by then. I had been hiking six miles a day and digging in the dirt for nearly three weeks after all! Haha I just looked up the definition of “swarthy,” and it actually fits me quite well! Reading your account of visiting the zoo and comparing it to your observation of Jaguars in their natural habitat gave me a “coming to Jesus” moment. I realized that like the Jaguar you observed in the zoo, I am also in captivity. I was born in captivity and all I know is captivity. I think all my life I’ve been fighting against it, as one would fight against the unknown. But if I were honest with myself, I don’t know any other way of life. What’s worse, I’ve come to this point in my evolution to peer at others in their natural habitat through the lens of social media. Reading your account and contrasting it with how we share our lives through the social networks allowed me to recognize that I’m not alone in my captivity. But this isn’t meant to be a downer comment. I want to share with you that if you hadn’t decided on research; to be an explorer and document your observations, I probably wouldn’t have known what I was fighting. I see myself in the mirror of the other animals in the zoos. I understand now why I sometimes aimlessly lie around. Or why I sleep when I should be awake. Or even why I find snowflakes falling from the sky wondrous as did the sun bear* in captivity in Japan. Thank you for sharing your work. It is life-affirming as it is life-changing. Wow, that’s quite a powerful reaction. Then again, I feel like most of us are living in captivity – although some people’s cages are more comfortable than others’. As you probably know from visiting zoos, animals kept in captivity often exhibit unnatural behaviors. You mentioned the lethargy that results from being trapped; I distinctly remember watching polar bears at the Cleveland Zoo incessantly pace back and forth. If so many people are caged as well, is it so surprising that everything’s falling apart right now? That said, one thing I was going to mention in the next Belize post is that most of the jaguars at the Belize Zoo were rescued. 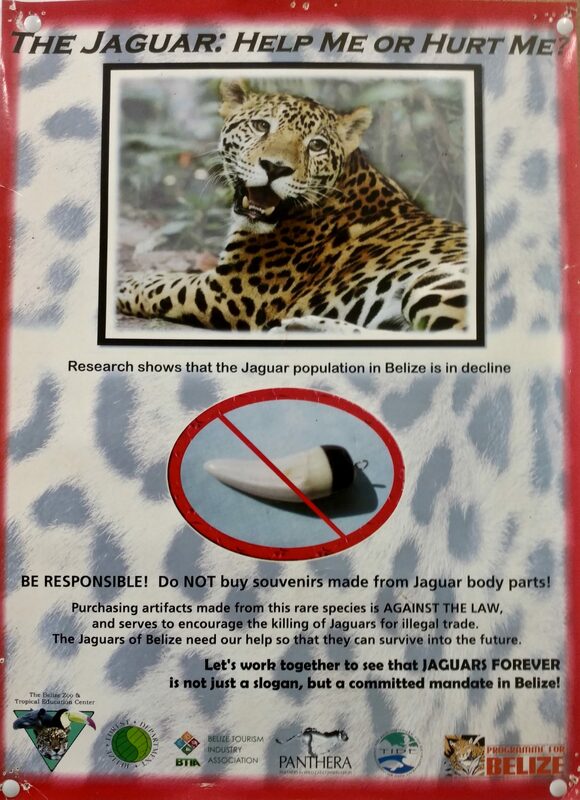 The Belize Zoo allows farmers who are having trouble with jaguars to trap the cats and give them to the zoo, instead of killing them. So while animals like jaguars definitely don’t belong in captivity, the zoo is literally saving their lives. The Belize Zoo also does a lot of other conservation-related outreach, which I’ll write about next time (if I can fit it into the post). I’m just working my way through some of your posts on Belize and it’s fascinating to hear about all these animals at the Belize Zoo – I shall definitely make an effort to visit when I go back for another visit. Thanks for a most interesting post and the comments were a pleasure to read too. I definitely recommend visiting the Belize Zoo next time you’re in the country. It’s a great way to learn about Belizean wildlife, and the staff is genuinely committed to conservation. Interacting with readers through comments is one of my favorite parts of blogging! This reminds me of a place I visited in Uruguay – it made me really sad to see the animals in little cages, but the funds are lacking and they’re probably trying their best. Do you think preservation should be attempted at all cost or are there exceptions, as in a ‘dignified’ life for the animal can’t be ensured? Yea, those of us from wealthier countries from should probably avoid passing judgement unless we truly know what the situation is. Hmm, that’s a tough question about preservation. I would like to always spare the life of a trapped jaguar, but if there’s no good institution willing to take the animal in then it might be better to put it down. I don’t know though, it’s a really hard question. Of course, the best thing to do is probably to release the animal back into the wild. The only exception would be if a trapped jaguar was confirmed (not just suspected) to have repeatedly preyed on livestock – by ‘repeatedly’ I mean more than once or twice. In that case the jaguar probably should be removed from the wild, or that one animals might generate enough animosity amongst local people to put all of the jaguars in an area at risk of being killed. Again, these are tough questions though. Ultimately they shouldn’t be answered by conservationists alone, but with serious input from local people. If enough local people disagree with what I’d like to do, then I’d go with what they want. About the comments, I’m actually not trying to affect anyone so much! I’m always surprised when my words lead people to great insights, but I’m thrilled that I was able to help in some way.